The New York Giants have waived/injured cornerback Matt Smalley, who dislocated his shoulder in practice earlier this week. The Giants signed Smalley as a rookie free agent after he impressed as a tryout player during the May mini-camp. Wide receiver Victor Cruz (groin), wide receiver Geremy Davis (hamstring), tight end Will Johnson (burner), left guard Justin Pugh (shoulder), defensive end Kerry Wynn (groin), cornerback Eli Apple (strained leg muscle), and cornerback Leon McFadden (bruised lower leg) did not practice. 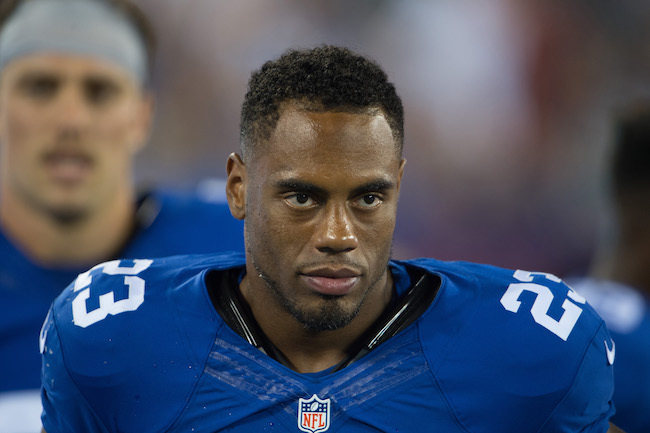 “(Pugh is) making some progress,” said Head Coach Ben McAdoo. Bobby Hart continued to work with the first-team at left guard in place of the injured Justin Pugh. Wide receiver Kadron Boone caught a deep pass from quarterback Logan Thomas. 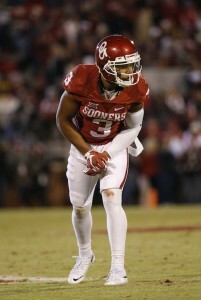 Bennett Jackson and newly-signed Joe Powell served as the third-team cornerback tandem. 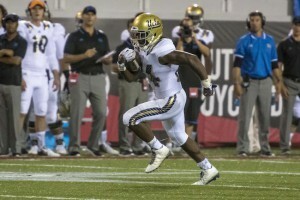 Jasper Brinkley worked with the first-team at middle linebacker; Keenan Robinson received first-team snaps at linebacker with the nickel defense. The first-team wide receivers were Odell Beckham, Sterling Sheppard, and Tavarres King in some sets. Myles White also worked with Beckham and Sheppard. Under pressure, quarterback Logan Thomas hit wide receiver Tavarres King deep for a touchdown against double coverage. Quarterback Logan Thomas hit tight end Jerell Adams down the left sideline. Linebacker Jasper Brinkley intercepted quarterback Ryan Nassib on the goal line during 7-on-7 drills. Wide receiver Anthony Dable continues to improve, adjusting well to the football. The first-team dime defense included defensive linemen Jason Pierre-Paul, Owamagbe Odighizuwa, and Olivier Vernon; linebackers Keenan Robinson and Jonathan Casillas; and defensive backs Janoris Jenkins, Trevin Wade, Dominique Rodgers-Cromartie, Darian Thompson, Leon Hall, and Landon Collins. There is no media availability on Friday as the team will be traveling to Buffalo for Saturday’s preseason game against the Bills. The New York Giants have signed cornerback Matt Smalley (Lafayette), one of the unsigned tryout players who participated in las week’s rookie mini-camp. 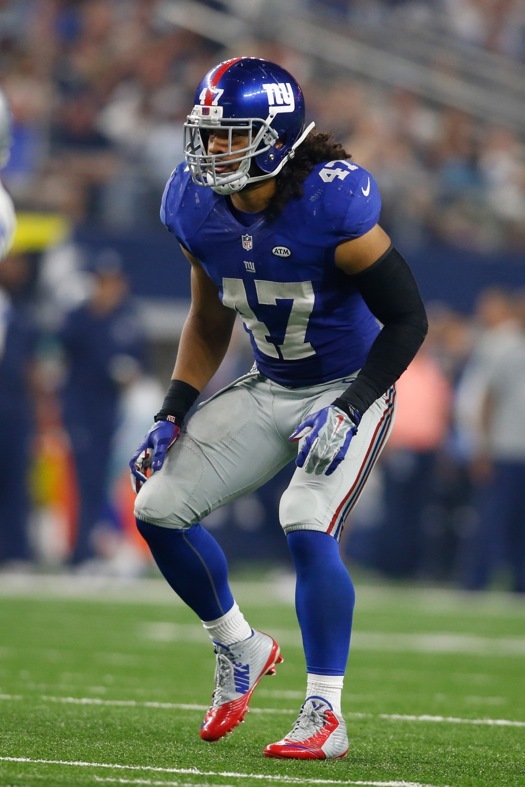 To make room for Smalley on the 90-man roster, the Giants waived/injured linebacker Uani ‘Unga. The 5’9”, 184-pound Smalley lacks ideal size but he has good quickness and speed. Smalley has experience returning punts and kickoffs. The Giants originally signed the undrafted ‘Unga to the team’s Practice Squad in December 2014. ‘Unga played far more than expected in 2015 due to injuries to other players. He played in 13 games with three starts, and finished the season with 59 tackles, 4 pass defenses, 2 interceptions, and 2 forced fumbles. The audio of ESPN Radio’s interview with quarterback Eli Manning on Tuesday is available at ESPN.com. 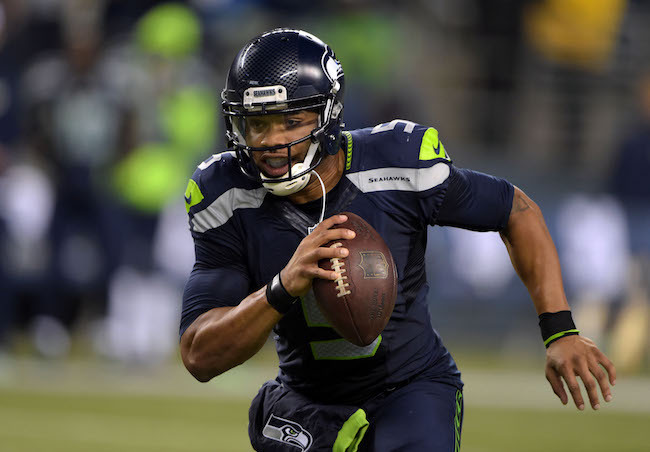 The New York Giants have signed quarterback B.J. Daniels, wide receiver Kadron Boone, and wide receiver Donte Foster after the veteran tryouts impressed at last week’s rookie mini-camp. The team also confirmed that it has signed rookie free agent defensive end Ishaq Williams. However, the team did not announce the signing of cornerback Matt Smalley, which had previously been unofficially reported. 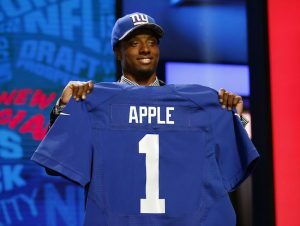 Daniels was originally drafted in the 7th round of the 2013 NFL Draft by the San Francisco 49ers. He has spent time with the 49ers (2013), Seattle Seahawks (2013-15), and Houston Texans (2015). Daniels has been on the game-day roster for eight contests, completing just one pass for seven yards and rushing six times for six yards. Daniels is a short (5’11”), well-built, strong-armed quarterback with very good overall athleticism, speed, and elusiveness. He rushed for 2,068 yards and 25 touchdowns as a read-option quarterback in college at South Florida. The Seahawks actually moved him to wide receiver in 2015. He’s a good enough athlete to even play some running back, safety, and kick returner. Daniels’ lack of height hurts him as a quarterback. He also needs to improve his overall accuracy as a drop-back quarterback. Daniels is a hard worker and takes the game seriously. Boone was originally signed as an undrafted rookie free agent by the Philadelphia Eagles after the 2014 NFL Draft. The Eagles cut him in August and he then spent time on the Practice Squads of the St. Louis Rams and Indianapolis Colts. 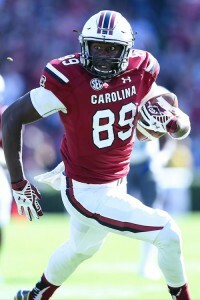 Boone is an average-sized receiver with good speed, agility, and hands. He runs good routes and is competitive. Foster was originally signed as an undrafted rookie free agent by the Minnesota Vikings after the 2014 NFL Draft. He spent time on the Practices Squads of the Vikings (2014 and 2015), San Diego Chargers (2015), and Dallas Cowboys (2015). The Cowboys waived him in March. Foster is an average-sized receiver with good speed, quickness, and leaping ability. He has excellent hands. Raw, Foster needs to improve his route running and physicality. Smart and hard working. The New York Giants have waived/injured wide receiver Ben Edwards and waived linebacker James Morris, quarterback Josh Woodrum, and tight end Cedrick Lang. The Giants originally signed Edwards after the 2015 NFL Draft, but waived/injured him in July after he pulled his hamstring during the June mini-camp. The Giants re-signed him to the Practice Squad in November and the 53-man roster in December. He played in the final two games and finished the season with one catch for nine yards. 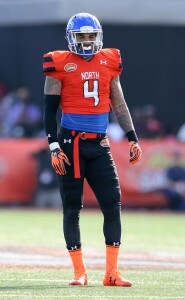 Morris was originally signed as an undrafted rookie free agent by the New England Patriots after the 2014 NFL Draft. The Patriots waived him in September 2015. Morris spent two stints each on the Giants’ Practice Squad and 53-man roster in 2015. He played in six games, primarily on special teams, before being placed on Injured Reserve in December 2015 with a quad injury. The Giants signed Woodrum and Lang as undrafted rookie free agents after the 2016 NFL Draft last week. Though not officially announced, the New York Giants have reportedly signed defensive end/linebacker Ishaq Williams (Notre Dame) and cornerback Matt Smalley (Lafayette), two of the unsigned tryout players who participated in this week’s rookie mini-camp. Other than a January all-star game, the 6’4”, 253-pound Williams last played football in 2013 after being implicated in an academic dishonesty scandal at Notre Dame. 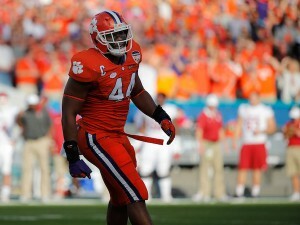 A good athlete, Williams played both defensive end and linebacker in college. 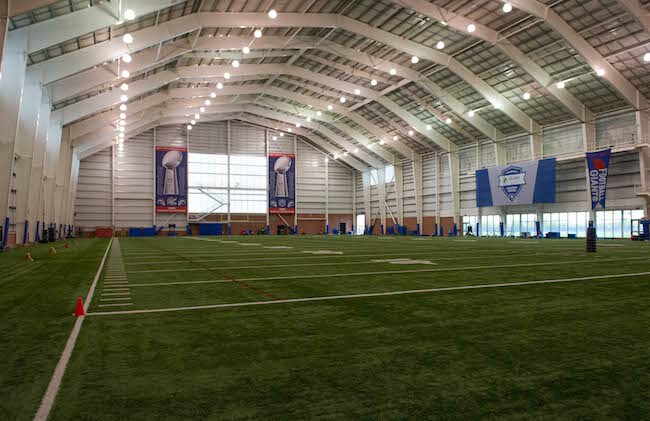 The second and last day of the New York Giants 2-day rookie mini-camp was held on Saturday at Quest Diagnostics Training Center in East Rutherford, New Jersey. Seventy-four (74) players – draft picks, signed rookie free agents, first-year players who have not completed a season of credited service, and street and rookie free agent tryout players – were in attendance. There was no media access to the Giants on Saturday. The news players worked with the strength and conditioning coaches on Sunday.